2015 Ford F150 King Ranch. 3.5L V6 EcoBoost, CarFax One owner, Extended Bed, Fiberglass tunnel cover , this F150 is in immaculate condition with only 35,739 Miles. 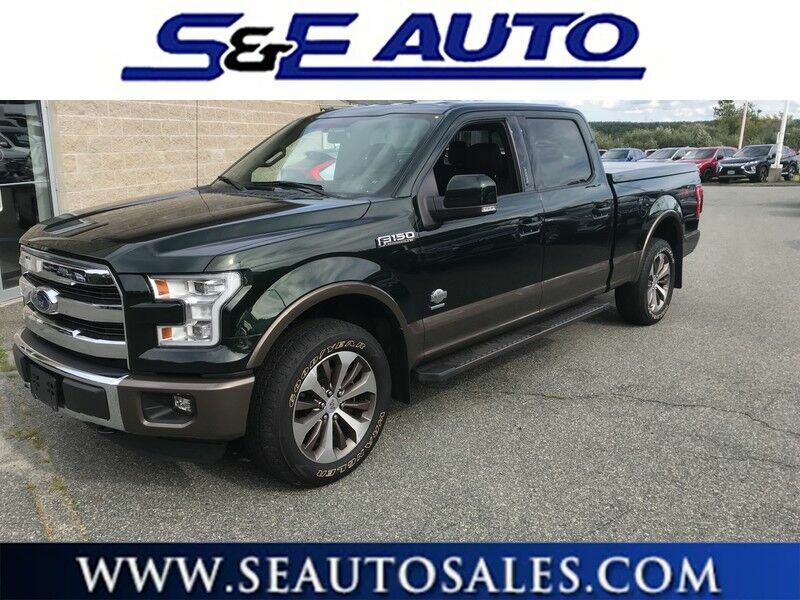 Includes Front/Rear All Terrain Tires, 20" Premium Wheels , Back-Up Camera, Leather Wrapped Heated Steering Wheel, Tow Hitch, Heated Mirrors, Front & Rear Heated Seats, Navigation, 8" Touch Screen Display, 8" Productivity Screen, Auto-Dimming Rear View Mirror. Comes Fully Serviced by our Certified Technicians and qualifies for our 10 YR/100,00 Miles Extended Warranty . The F-150 might be the most important vehicle made by Ford. It continues to be one of their top selling vehicles, encouraging Ford to put their best foot forward with the 2015 model. The F-150 competes with the Dodge Ram, the Chevrolet Silverado and the GMC Sierra 1500 among others, in the full sized truck category. Ford is clearly pushing their new technology and new ideas with the F-150 offering lots of options not available anywhere else in this class, such as a 360 degree camera and integrated loading ramps stowed in the pickup bed . A smaller, more fuel efficient Ecoboost engine is also available for 2015, which should further improve fuel economy while providing the same kind of horsepower that would normally be delivered by mid-grade V8 engines. At the same time, the F-150 continues to excel at traditional truck tasks, with a best in class towing capacity of 12,200 lbs. when properly equipped.This model sets itself apart with turbocharged engines, available in a huge variety of trims, Towing capacity, rugged durability, and improved gas mileage. With an origin window sticker of $56,840, this Ford F150 is another example of the highest quality vehicles at S&E Auto Sales . We accept all trades and offer financing with the lowest rates available plus have approvals for all credit scores. Call today to check availability and to schedule a test drive. T his Ford F-150 has been loved by its original owner as CARFAX shows it to be a one-owner. Pull up in the vehicle and the valet will want to parked on the front row. This Ford F-150 is the vehicle others dream to own. Don't miss your chance to make it your new ride. This 4WD-equipped vehicle will handle beautifully on any terrain and in any weather condition your may find yourself in. The benefits of driving a 4 wheel drive vehicle, such as this Ford F-150 XLT w/HD Payload Pkg, include superior acceleration, improved steering, and increased traction and stability. It's not often you find just the vehicle you are looking for AND with low mileage. This is your chance to take home a gently used and barely driven Ford F-150. Feel at ease with your purchase of this Ford F-150 XLT w/HD Payload Pkg, all records are included allowing you to truly know what you're buying. This Ford F-150 XLT w/HD Payload Pkg is in great condition both inside and out. No abnormal "wear and tear". Want a mobile theater? This Ford F-150 has a premium entertainment package that will keep your passengers entertained with superb enjoyment. Why go with a basic vehicle when you can have it all in this well-optioned Ford F-150? Added comfort with contemporary style is the leather interior to heighten the quality and craftsmanship for the Ford F-150 Let's be honest, not everyone wants to set a course blindly into the dark. For those of us that don't, there are vehicles like this with stellar navigation systems. The upgraded wheels on this vehicle offer improved handling and an attractive appearance.